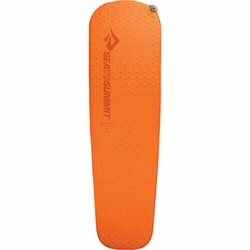 Sea to Summit UltraLight SI Mat. Light and packable for minimalist fast hikes, the Ultralight Self-Inflating mats come in at 1 inch thick with the regular size weighing just over 1 lb. Sea to Summit kept the weight down by using a 30-D polyester and our Delta Core-V™ vertical coring which keeps body contact areas warmer while still offering great support and packability. Constructed using Sea to Summit's Delta Core-V™ technique to minimize weight and bulk yet maximize warmth. Using pressure-mapping data to define the contact areas Sea to Summit created a “map” for their distinctive core pattern. This technique keeps body contact areas - shoulders, hips and feet - warmer because the core holes are smaller in those sections. Features a patent-pending multi-functional valve. High flow rate for easy inflation; one-way deflation mode prevents re-inflating while packing up and fine-tuning bleed valve for customized comfort. Lightweight 30D polyester with extrusion laminated TPU used on the top and the base. Anti-slip silicone print on the top and bottom helps keep your mat in place. Made with environmentally friendly polyurethane foam that is very lightweight yet still offers excellent memory and self-inflating performance. Comes with a 30-Denier stuff sack and easy to use repair kit. The Ultralight Series has an insulating R-value of 2.6.